This Absco single garage can be used for a variety of purposes, as a workshop, to garage your car or boat or as an entertainment area. Absco provides high-quality Australian made buildings, which are manufactured, from Australian made BlueScope Steel. The all-steel structure also means the garage shed is strong, versatile, weatherproof and easy to maintain. This single garage shed can be used for a variety of purposes, as a workshop, storage for small vehicles, boats simply storage. 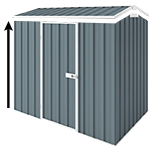 This garage shed is engineered to withstand winds of up to the wind rating of W41N3 - non-cyclonic rated. They are DIY and come flat packed with everything you need including a manual. You will need some tools and we recommend watching some of our videos before building.